SHANGHAI – The era of the connected car is here and HARMAN International Industries, Incorporated (NYSE:HAR), the premier audio, visual, infotainment and enterprise automation group, will give Shanghai Auto show attendees an immersive showcase experience with futuristic, eye-popping audio, infotainment, and automotive services technologies, making it one of the must-visit spots at the show. At the booth, HARMAN will host the “Engineering the Connected Car” panel discussion, bringing together senior executives to share insights and vision on the future of the connected car. The panel discussion is at 10:30 – 11 am on Tuesday, April 21, 2015. Panelists include IP Park, Chief Technology Officer, HARMAN; Dr. Feng Shen, Vice President of R&D, Volvo; Dr. Liu Jun, Vice President at Baidu; Mr. Steven Liu, Vice President, Terminal Mobile Broadband Products Line, Huawei; and Dr. Frank Zhao, Director of Tsinghua Automotive Strategy Research Institute. 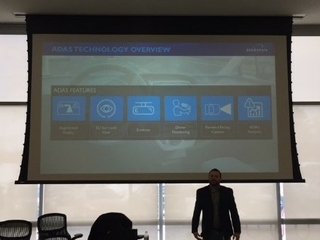 In addition to the panel, HARMAN has an abundance of technological innovations displaying the company’s leadership in promoting the connected car of the future while also providing customers with the ultimate car audio experience. First shown at the CES 2015, HARMAN will display its new embedded infotainment platform which is available globally. Cost-optimized to offer feature-rich, automotive-grade smartphone integration and scalable connectivity options, the Smart Essentials Infotainment Platform enables automakers to use the same flexible infotainment platform to affordably address a diverse range of international markets and vehicle classes. Using the latest multi-core system-on-chip hardware, the platform is designed using a flexible Linux OS framework. It leverages today’s smartphone experiences, including CarPlay and Android Auto, and supports MirrorLink integration for familiar and simple use of popular mobile applications. Moreover, for its Integrated Essentials Cockpit, HARMAN merges the Smart Essentials Platform with proven instrument cluster technology to offer a state-of-the-art single-display solution. The Smart Essentials Infotainment Platform is adaptable to a variety of vehicles ranging from entry to lower mid segment, and provides automakers with the best feature-to-cost radio, with a range of options that meets virtually all global market-specific requirements. Shown in China for the first time, this is the new iteration of HARMAN’s premium scalable infotainment platform. Its new intelligent connected navigation enables a new generation of driver usability and feature functionality. The platform also integrates industry-leading over-the-air (OTA) map and software update features, which seamlessly deliver infotainment firmware and map content updates to in-vehicle navigation systems. HARMAN will also showcase a new “floating” car data framework (FCD), which collects and aggregates camera, sensor and on-board diagnostics (OBD) data and integrates it with both on-board and off-board systems. At Shanghai, HARMAN will also showcase new Aha Cloud Services designed to change how automakers and partners measure quality, handle service and market to consumers, and provide the interactive platform that makes the full benefits of connected vehicles possible. First shown at this year’s CES in Las Vegas, the new Aha Analytics Services platform is currently helping automakers validate and qualify vehicle performance during pre-production deployments. Aha Updates allows automakers to safely and cost-effectively update a variety of a vehicle’s software-driven applications and connected devices wirelessly. Show attendees will also be able to demo HARMAN’s revolutionary in-car audio technology, Road Noise Cancellation (RNC). The technology minimizes unwanted low frequency broadband noise that is transmitted from road surfaces into the vehicle cabin through tires, suspension, and vehicle body components. Based on the principle of "anti-noise," RNC uses accelerometers placed strategically along the path of noise transfer to provide a reference signal to generate an anti-noise sound wave that is output through the vehicle’s standard audio system, thereby creating a more quiet and comfortable cabin. Additionally, the technology enables OEMs to pursue measures to improve vehicle weight and handling without impacting interior noise levels. RNC features HARMAN’s patented True Audio technology to ensure that in-cabin audio remains unaffected by noise cancellation. RNC is part of the award-winning HALOsonic technology suite of active noise management solutions, which was developed to tackle the acoustic challenges within the unique automotive environment of traditional, electric and hybrid cars. Another innovative audio technology showcase at Auto Shanghai 2015 is HARMAN’s Individual Sound Zones (ISZ) technology. This technology enables drivers and passengers to create sonic zones between individuals for the ultimate personalized car audio experience. The solution can help to reduce the clutter of different sounds in the car – from navigation commands to phone calls and music – ensuring that all occupants in the vehicle hear only what matters to them. The ISZ technology can be integrated into any HARMAN in-car audio system via the amplifier, providing automakers limitless possibilities to further enhance in-car listening experiences. It is available now to all automakers.